Ah, the pre-collections. As we eagerly await the main events (Fall fashion week hits this February, and couture isn't until the end of the month) we have pre-collections to tie us over and feed our hungry fashion appetites. Often geared towards the consumer and made for commercial success, pre-fall offers us an opportunity to get a hint at what designers are working on for fall. 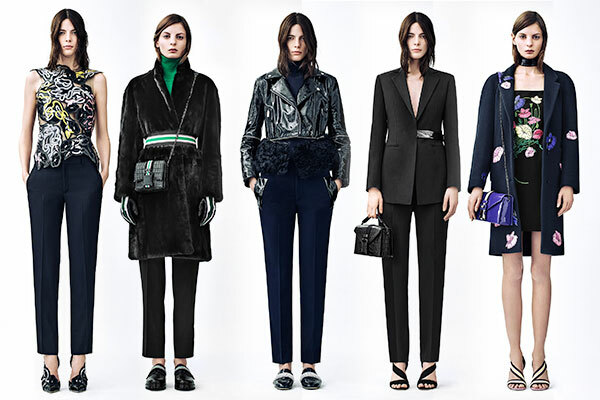 The trend of the pre-fall collections this time around? Effortless coolness. Everywhere I turn it seems designers are vying to be the coolest clothes makers around, showing current cool girl staples such as turtlenecks, culottes, and sculptural jewelry. I love Christopher Kane's constant ability to utilize fabrics and traditional clothe-making methods in new and inventive ways. Lace and embroidery have never looked as badass as they do when Kane gets his hands on them, and for pre-fall he returned to some of his creative staples and reapplied them once again in a more wearable style. 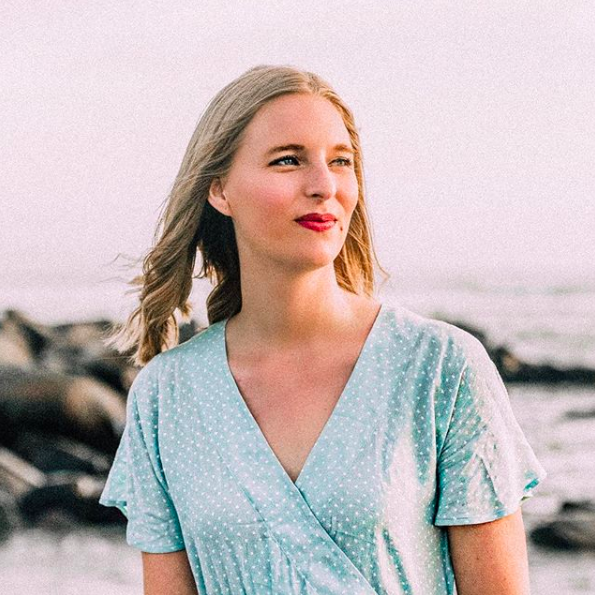 There's a mix of avant-garde looks and minimal, streamlined pieces for the girl who prefers a cleaner look with unexpected details, like stripes of patent leather defining a blazer waist, or a geometric keyhole detail on a dress. One of my favorite looks was the Margot Tenenbaum-esque black fur coat and green turtleneck combo, complete with an athletic-stripe belt in a matching apple green. Equal points quirky and cool, and just the way we like it. Talk about cool girl fashion bait. The J.W. 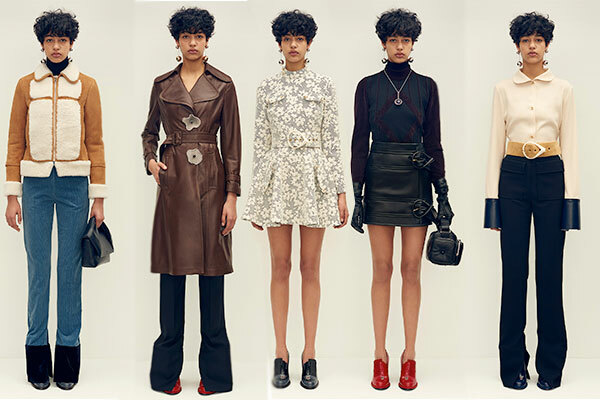 Anderson pre-fall collection seemed to be designed by the Man Repeller's Leandra Medine (I'm sure she's already got that shearling-block jacket on pre-order) or another fashion-loving street style star. Turtlenecks, flare jeans, mules, and disco-ball earrings? Be still my beating heart, it's almost too much goodness to bare. Perhaps my favorite styling detail are the too-long contrast shirt sleeves. Sure, they may not be the most practical, but they definitely look fascinating. The whole collection is very 70s, with a bit of 80s and 90s thrown in just for good nostalgia measure, and it hits at all the right points to create an overall commercially-successful look. These pieces are going to come flying off the shelves, mark my words. Rochas always has a certain quirkiness to it that I absolutely adore. There's a cool grandma feeling to oversized coats over full taffeta skirts and the velvet mary janes, right down to the glove print motif, and I wouldn't want it any other way. Rochas is always a bit vintage in all the right ways, and this collection is no exception. I love the blending of deep, rich fall colors with pops of bright hues like that electric blue coat, making sure we never know quite what to expect. 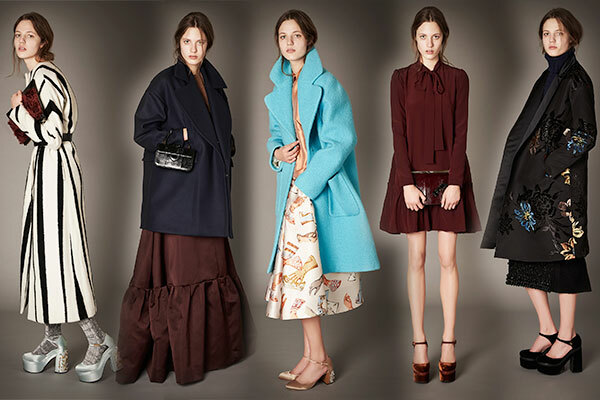 I always think that Rochas is seriously underutilized in editorials and on the red carpet, so hopefully editors and stylists take note of the continual delightful collections as they look to make runway picks. Cool girl looks from the coolest of the cool herself, Stella McCartney continually impresses with her offerings for every collection, major and minor. For pre-fall she's continuing her exploration of the sweater suit, this time with wide legs and asymmetrical cuts, as well as making the beret a fashionable headpiece option again (hooray!). Though McCartney is strictly vegan, she doesn't shy away from faux fur and vegan leather, and she even had a fuzzy bear suit looking thing that I'm sure will be all over editorials come July. 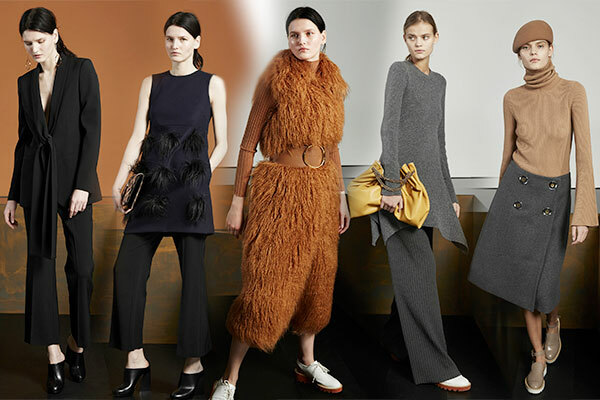 The king of American sportswear, Michael Kors knows how to make something sell without sacrificing style or taste. The key is all in the styling: mixing a sparkly shift dress with sporty cross-strap sandals, or tossing a luxurious fur-trimmed leather coat over a simple black and white striped T-shirt dress, the perfect blending of high and low, luxe and sport (aka sport-luxe, which Kors has seemed to have perfected). The best look may be the peacoat and turtleneck paired with a red and white track pant. Anytime a designer makes a sporty staple seem undeniably chic, you have to give them a round of applause. You know street style stars will be emulating this look come fashion week. 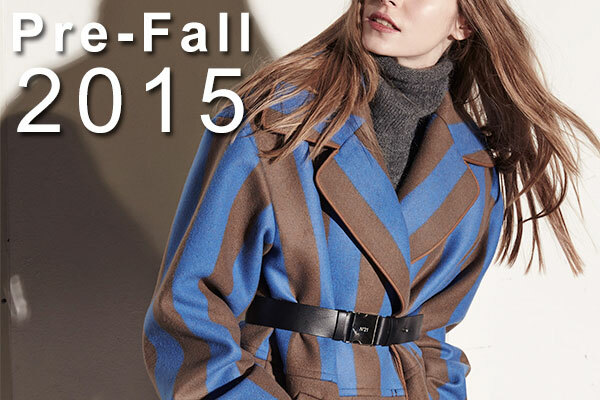 What are your favorite pre-fall 2015 collections?